Voodoo! is one of those albums that if not for the efforts of a few fans might had been lost to history. When it was released by the Tops Record Company in 1960 is was seen as just another knock-off exotica record. Robert Drasnin was a young composer who had been known mostly for his work for television and movies. He was given an assignment to create an album that basically sounded like Martin Denny. (Drasnin would later actually work with Denny on his albums Latin Village and A Taste of Honey.) 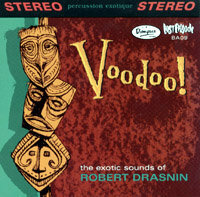 Drasnin, who was much more a straight ahead jazz composer, quickly came up with the twelve original tracks that comprise Voodoo! Fast forward a few decades. The start of the retro-lounge/exotica movement was just starting. Fans of the genre were digging around in thrift stores and garage sales for hidden musical gems. They find this album called Voodoo! (or Percussion Exotique--one of the titles it was given for a re-packaging). With one listen they realize that Drasnin was anything but a hack music writer. His tunes on Voodoo! rival those of any of the exotica masters. He had perfectly captured the exotic rhythms, percussions, and general intrigue that would cause your standard surburban bachelor to drift into a South Seas fantasy. With the help of Dionysus records, a CD was made from a virgin vinyl pressing of the album. (At the time they thought the master tapes to be lost, but the masters were later found and a second CD has been made from them.) If not for love of a few dedicated fans, the current generation of exotica music lovers might have never known the strange beauty that Voodoo! possesses. Robert Drasnin is still with us and actually teaches music at UCLA. There's a great interview with Drasnin here.